San Francisco and Los Angeles stand out as a couple of California's most famous coastal cities, but the Golden State has a very long coastline with a lot of other gems along the way. Monterey, situated in Monterey County in the Central Coast region of California, is a key example. Incorporated in 1890 and named in honor of Gaspar de Zúñiga, 5th Count of Monterrey, Monterey covers 12.25 square miles and is home to a little over 28,000 people. This city is nicknamed the 'Language Capital of the World' due to a big focus on teaching and learning multiple languages and is also known as 'California's First City' due to the fact that it is home to many of the state's 'firsts' like the first theater, the first public school, the first public library, and more. The city is also famous due to the fact that its Cannery Row sardine-packing center was written about in John Steinbeck's 'Cannery Row' story. Along with these key historical sites and rich past, Monterey is also home to some fun family attractions and exciting annual events like the Monterey Bay Aquarium, the annual Monterey Jazz Festival, the Fisherman's Wharf area, and Lovers Point Park. Clearly, there's a lot to be done and seen all around Monterey, so the city is a popular stopping point on road trips and coastal tours of California. If you're planning to stop off in Monterey and check out some of the key locations in this lovely little city, you'll find a lot of highly rated campgrounds and RV parks just waiting to welcome you in. Lots of the local Monterey RV parks feature long lists of amenities like pools, club houses, game areas, and more. 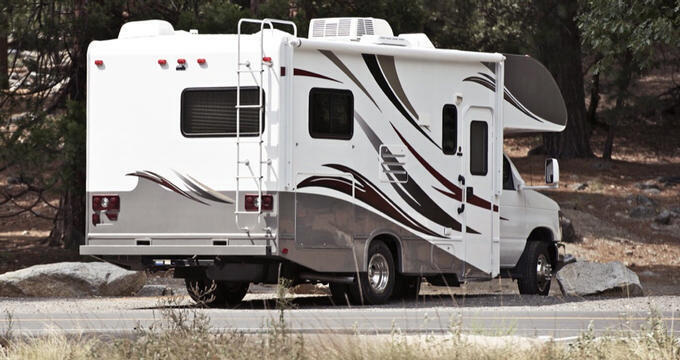 Read on to learn all about the best RV parks in Monterey and the surrounding area. Conveniently located in a great spot not far from all the major attractions and landmarks of the city, Monterey Pines RV Campground is one of the top RV parks to choose if you're looking to spend some time in this area. Highly rated by past guests, this RV park is very easy to access and just a few minutes away from Monterey Regional Airport too. It's open all year long but has less than 40 RV sites, so bookings in advance are strongly recommended due to the popularity of the area. This is a family friendly and pet friendly RV park, so you can bring your furry friends along for some fun in the Monterey sun, and all dogs must be kept on leashes at all times around the park. Monterey Pines RV Campground is a relatively no-frills RV park but still has some basic amenities like a dump station, laundry machines, showers, and restrooms. It also has an on-site snack bar offering good quality food and drinks when you need them. In short, this is a great RV park that can help you make the most of your stay in the Monterey area. If location is one of your top factors of consideration when booking a stay at an RV park or campground, Monterey Fairgrounds RV Park is definitely going to appeal to you. This Monterey RV park is in an excellent spot, just a few minutes away from the waterfront areas and key locations like Cannery Row. This RV park is actually located at the Monterey County Fair and Event Center, so it's a lively location as well and there's always something fun to look forward to, with lots of good quality restaurants and interesting shops nearby. On-site amenities at this Monterey RV park include full hook-up RV sites, clean showers, a coin operated laundry area, high speed wireless internet access for all guests, and more. There's a 10% discount on all stays at Monterey Fairgrounds RV Park for military members and the elderly, and the park is well suited for both long- and short-term stays. This is also a pet friendly RV park and is welcoming to guests of all ages, making it a great spot for families to base themselves for trips around Monterey. Up in the northern side of the city of Monterey, Marina Dunes RV Park is another excellent option for RV travelers and campers in the area. Beloved by guests, this RV park is family friendly and pet friendly, welcoming every guest with a friendly smile and a homely environment. Marina Dunes RV Park is literally just a few minutes away from the beach by foot, making it an excellent RV park to choose if you're visiting Monterey to spend some time soaking up the sun or enjoying the warm waters of the Central Coast, and it's only a 10-minute drive from Downtown Monterey and the main attractions like Cannery Row. On site amenities at this Monterey RV park include a large patio for picnics and BBQs, sports courts, free cable TV channels for all guests, fast Wi-Fi for everyone, a large clubhouse with flat screen TV and a cozy fireplace, large RV sites with shrubbery for intimacy, horseshoe pits, and more. The staff at this particular RV park are also said to be extremely friendly and welcoming, always ready to help out and offer advice or directions to help you make the most of your stay in the Monterey area.